Mounting and dismounting your tyres requires special skill and should be left to professionals who have the proper training and equipment. Before dismounting any tyre, the valve and its mechanism have to be removed to allow the tyre to completely deflate. It is very important to change the various components related to mounting new tyres: wheel weights, the valve, the valve cap, and the tube (for tube-type tyres). Some tyres are directional and must be mounted with a certain orientation. Their external side (outside) is sometimes marked. When mounting the tire on the rim, it is very important not to exceed a pressure of 3.5 bar. When mounting is completed, be sure that the valve caps are tightened so as to insure maximal airtightness for your new tyres. As a final step, check that the wheel bolts are tightened after about 65 miles. In order to eliminate vibrations and imbalance in the turning mechanism, tyres must be balanced each time they are changed. Balancing is necessary for both the front and rear tyres of your vehicle. Be aware that your tyres and the mechanical parts of your vehicle such as the suspension, the bearings or the steering are only a few examples of the components that can wear prematurely if your tyres are not balanced. Checking the geometry may be necessary, since it can be slightly out of true, for example, following an impact against a pavement. 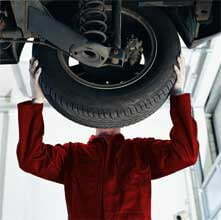 Correct geometry increases the life of your tyres, improves the road holding of your vehicle and promotes fuel economy. Poor geometry is hard to detect when driving; this is why PNEUS ONLINE recommends that the geometry is checked every time a tyre is changed. Note that your vehicle's behaviour and your safety may be compromised by poor geometry. after turning, the wheels do not quickly return to the "straight line" position. Defective components or a strong impact (hitting the sidewalk, for example) that modifies the initial configuration will most often require adjustments in the geometry. Be careful not to store your tyres in a careless manner. There are a few basic rules to follow. At the beginning of winter, when you dismount your summer tyres, it is a good idea to label them with two letters (FR for front right, BL for back left, etc.) This will allow you to mount them correctly at the end of winter. Of course, the same holds true for winter tyres. It is important to wash your tyres and to remove pebbles stuck in the tread. Tyres should be stored in a cool, dry place, away from light.